Landri’s 5k & 1st Donut! Question of the day: Is Landri showcasing her Downward Facing Dog, mid – Sun Salutation? OR did she just fall down in her marshmallow suit and can’t get up? For as much as I run, somehow Landri has only participated in one official 5k with me (when she was only 7 weeks old). Today, more than a year later, she rode along for her second 5k ever – the Jingle Bell Run in Gruene, TX. 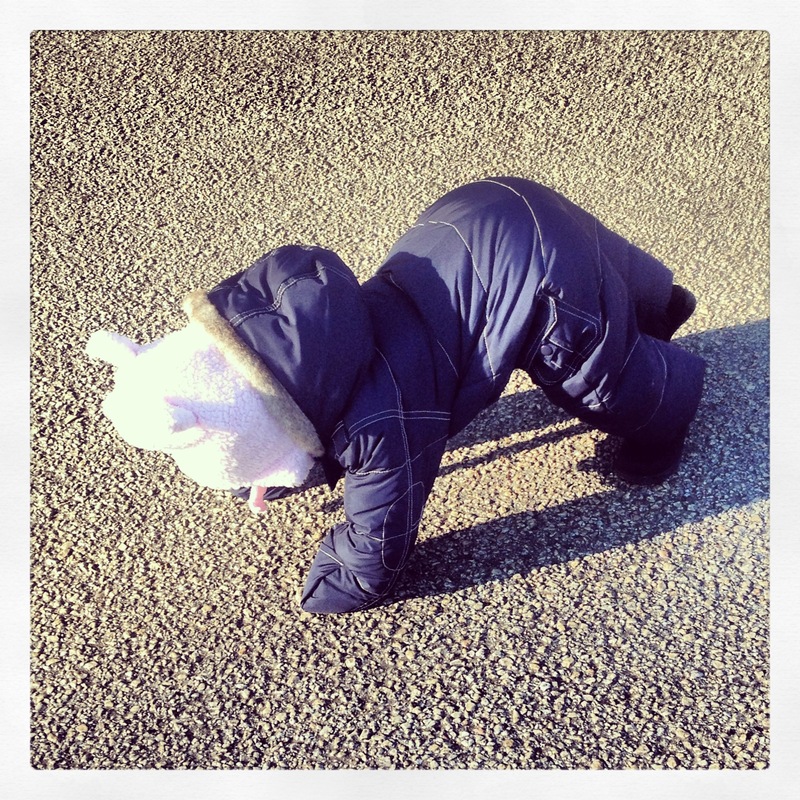 It was cold this morning – low 40’s at the start of the race, so we had borrowed a snowsuit to keep munchkin warm. We had a blast and ran with one of my pledge sisters from college and her FOUR YEAR OLD daughter who is a total rockstar, running the race in about 42 minutes, a little over a 13 min mile pace! Truly incredible, especially considering that I couldn’t even get Scott to run 3 miles this week (he lasted about 0.7 miles)!!! At one point during the race, we passed two women who were walking and my friend said she overheard one of them say, “Okay, that one’s pregnant, and the girl is like 3, we need to go faster.” LOL! It was a great run – we’ll have to dress up next year for sure! Landri was very well behaved and even toddled around afterwards in her snowsuit – very Christmas Story-like. And of course she fell down and could not get up which was hilarious. You can see a small clip of her trying to regain her footing here: http://youtu.be/Z-sgDV7mLc8. After the race, we had to go to the UPS store to mail some stuff and we walked down to the donut shop and got Landri her first donut – chocolate with rainbow sprinkles. It was a big hit and she didn’t miss hardly a single sprinkle! Here’s a video of her eating it (probably not too exciting for you non-family members, LOL): http://youtu.be/RmZjaMfCo7o, and then a better video – one of her reaction to eating the last bite (this one’s just funny; I think it’s safe to say she might like donuts): http://youtu.be/8lzRBh0PYz8. Is Landri practicing yoga or unable to stand up in her marshmallow suit?